VICELAND: Stephen Jamieson, Brian McCulloch and Steven Caddis, all from Paisley, and Caddis’s brother Gary, from Glasgow. 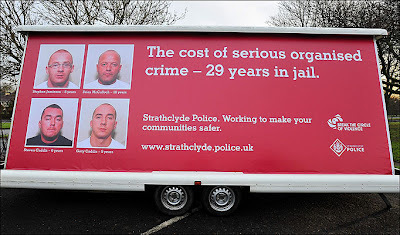 huge image, launched today at Pollok Community Centre by Scottish Justice Secretary Kenny MacAskill, will be driven around west Scotland in an advertising trailer as part of a new crime strategy . The controversial step follows the gangland shooting of Kevin “Gerbil” Carroll last Wednesday in daylight in a car park in Robroyston. It also follows a similar scheme with gun crime in Manchester. The first gangsters to be featured are Stephen Jamieson, Brian McCulloch and Steven Caddis, all from Paisley, and Caddis’s brother Gary, from Glasgow. The four men ran a cocaine empire worth millions of pounds and were jailed last October for a total of 29 years. Different convicted gangsters could be featured in future campaigns. Mr MacAskill called for a co-ordinated approach to stop “evil” from prevailing in certain communities. He said: “In tackling organised crime we need to change a culture that describes some as colourful businessmen. They are not. They are gangsters and criminals who prey on our communities. Detective Inspector Graham Mayo said: “We want to make clear to everyone, particularly young people, that serious organised crime does not pay. The four men featured on the poster were caught after a 15-month police surveillance operation involving up to 100 officers a day. Almost £9million of drugs, a cache of machine guns and other weapons, seven luxury cars and almost £500,000 in cash were seized. 0 Response to "Stephen Jamieson, Brian McCulloch and Steven Caddis, all from Paisley, and Caddis’s brother Gary, from Glasgow."